Please contact us for complete specifications and pricing. Download the Products brochure (PDF). Solar Rover Inc has products to fit many of your clean energy needs. 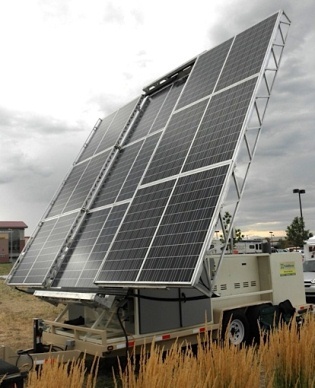 Mobile power systems using the energy supply of the sun and safe clean battery systems to supply a, mobile, "around-the-clock" electrical power source. Mobile solar energy lighting systems. Minimal setup, silent operation and zero CO2 omissions. Anywhere, any season. Fixed and temporary, multiple supply power source systems. Solar cell systems supplemented with wind powered or propane powered generators and battery support. For remote "off-the-grid" locations requiring a quick and clean method of supplying electricity.